HM í fótbólti 2018 endaspælið var tann seinni og endaligi parturin av kappingini, og byrjaði beint eftir bólkaspælið. Endaspælið byrjar 30. juni við áttandapartsfinalum og endaði 15. juli við finaluni, ið varð spæld á Luzhniki Stadium í Moskva. Tvey av liðunum ið endaðu ovast í hvørjum bólki (16 í alt) fóru víðari til knockout dystirnir, har ið taparin varð útsligin og vinnarin fór víðari. Ein triðja pláss play-off varð eisini spældur millum teir báðir tapandi hálvfinalistarnar. Tey bæði ovastu liðni úr hvørjum bólki í teimum átta bólkunum kvalifiseraðu seg víðari til endaspælið. 30 minuttir av eyka leiktíð um neyðugt. Brotssparkskapping um tað enn stendur javnt. Í mesta lagi tríggjar innskiftingar, tó er ein fjórða loyvd í eyka leiktíðini. ↑ "FIFA World Cup Russia 2018 – Match Schedule" (PDF). Fédération Internationale de Football Association. https://resources.fifa.com/mm/document/tournament/competition/02/66/71/62/2018fwc_matchschedule_20122017_en_neutral.pdf. ↑ 2.0 2.1 2.2 "Regulations – 2018 FIFA World Cup Russia" (PDF). Fédération Internationale de Football Association. https://resources.fifa.com/image/upload/2018-fifa-world-cup-russiatm-regulations-2843519.pdf?cloudid=ejmfg94ac7hypl9zmsys. ↑ "Match report – Round of 16 – France v Argentina" (PDF). Fédération Internationale de Football Association. 30 June 2018. https://resources.fifa.com/image/upload/eng-50-0630-fra-arg-fulltime-pdf-2978911.pdf?cloudid=l8h65vfw78efsgdhw6rh. ↑ 4.0 4.1 4.2 "Tactical Line-up – Round of 16 – France v Argentina" (PDF). Fédération Internationale de Football Association. 30 June 2018. https://resources.fifa.com/image/upload/eng-50-0630-fra-arg-tacticalstartlist-pdf-2978780.pdf?cloudid=miumldifqrl12r0z6iac. ↑ "France v Argentina – Man of the Match". Fédération Internationale de Football Association. 30. juni 2018. https://www.fifa.com/worldcup/matches/match/300331537/#motm. ↑ "Match report – Round of 16 – Uruguay v Portugal" (PDF). Fédération Internationale de Football Association. 30 June 2018. https://resources.fifa.com/image/upload/eng-49-0630-uru-por-fulltime-pdf-2979193.pdf?cloudid=a7jclf27zzuzjo520mpz. ↑ 7.0 7.1 "Tactical Line-up – Round of 16 – Uruguay v Portugal" (PDF). Fédération Internationale de Football Association. 30 June 2018. https://resources.fifa.com/image/upload/eng-49-0630-uru-por-tacticalstartlist-pdf-2978979.pdf?cloudid=datc0fn4ilg9aertqdff. ↑ "Uruguay v Portugal – Man of the Match". Fédération Internationale de Football Association. 30 June 2018. https://www.fifa.com/worldcup/matches/match/300331544/#motm. ↑ "Match report – Round of 16 – Spain v Russia" (PDF). Fédération Internationale de Football Association. 1 July 2018. https://resources.fifa.com/image/upload/eng-51-0701-esp-rus-fulltime-pdf-2979634.pdf?cloudid=rix0h2ufiablhohc1hsj. ↑ 10.0 10.1 10.2 "Tactical Line-up – Round of 16 – Spain v Russia" (PDF). Fédération Internationale de Football Association. 1 July 2018. https://resources.fifa.com/image/upload/eng-51-0701-esp-rus-tacticalstartlist-pdf-2979495.pdf?cloudid=cjisihytk6zmh7qcqggt. ↑ "Spain v Russia – Man of the Match". Fédération Internationale de Football Association. 1 July 2018. https://www.fifa.com/worldcup/matches/match/300331517/#motm. ↑ "Match report – Round of 16 – Croatia v Denmark" (PDF). Fédération Internationale de Football Association. 1 July 2018. https://resources.fifa.com/image/upload/eng-52-0701-cro-den-fulltime-pdf-2979944.pdf?cloudid=jq9prvpwlrv6snvywypi. ↑ 13.0 13.1 13.2 "Tactical Line-up – Round of 16 – Croatia v Denmark" (PDF). Fédération Internationale de Football Association. 1 July 2018. https://resources.fifa.com/image/upload/eng-52-0701-cro-den-tacticalstartlist-pdf-2979670.pdf?cloudid=q5u9ydu7veyhmuwhudko. ↑ "Croatia v Denmark – Man of the Match". Fédération Internationale de Football Association. 1 July 2018. https://www.fifa.com/worldcup/matches/match/300331498/#motm. ↑ "Match report – Round of 16 – Brazil v Mexico" (PDF). Fédération Internationale de Football Association. 2. juli 2018. https://resources.fifa.com/image/upload/eng-53-0702-bra-mex-fulltime-pdf-2980315.pdf?cloudid=vnzih2otqmj4utrtypmc. ↑ 16.0 16.1 16.2 "Tactical Line-up – Round of 16 – Brazil v Mexico" (PDF). Fédération Internationale de Football Association. 2 July 2018. https://resources.fifa.com/image/upload/eng-53-0702-bra-mex-tacticalstartlist-pdf-2980213.pdf?cloudid=hfbp33weswb9v6iwldsz. ↑ "Brazil v Mexico – Man of the Match". Fédération Internationale de Football Association. 2 July 2018. https://www.fifa.com/worldcup/matches/match/300331535/#motm. ↑ "Match report – Round of 16 – Belgium v Japan" (PDF). Fédération Internationale de Football Association. 2 July 2018. https://resources.fifa.com/image/upload/eng-54-0702-bel-jpn-fulltime-pdf-2980472.pdf?cloudid=ugv6xpyriwiy95zo8izr. ↑ 19.0 19.1 "Tactical Line-up – Round of 16 – Belgium v Japan" (PDF). Fédération Internationale de Football Association. 2 July 2018. https://resources.fifa.com/image/upload/eng-54-0702-bel-jpn-tacticalstartlist-pdf-2980381.pdf?cloudid=yevjv3kq9gbnzoh9qka9. ↑ "Belgium v Japan – Man of the Match". Fédération Internationale de Football Association. 2 July 2018. https://www.fifa.com/worldcup/matches/match/300331551/#motm. ↑ "Match report – Round of 16 – Sweden v Switzerland" (PDF). Fédération Internationale de Football Association. 3. juli 2018. https://resources.fifa.com/image/upload/eng-55-0703-swe-sui-fulltime-pdf-2981293.pdf?cloudid=x8euhzw50bbr0wy1voyg. ↑ 22.0 22.1 22.2 "Tactical Line-up – Round of 16 – Sweden v Switzerland" (PDF). Fédération Internationale de Football Association. 3. juli 2018. https://resources.fifa.com/image/upload/eng-55-0703-swe-sui-tacticalstartlist-pdf-2981204.pdf?cloudid=llqogr845x5tgvqjhnor. ↑ "Sweden v Switzerland – Man of the Match". Fédération Internationale de Football Association. 3. juli 2018. https://www.fifa.com/worldcup/matches/match/300331514/#motm. ↑ "Match report – Round of 16 – Colombia v England" (PDF). Fédération Internationale de Football Association. 3 July 2018. https://resources.fifa.com/image/upload/eng-56-0703-col-eng-fulltime-pdf-2981688.pdf?cloudid=clvyozknxzlgjbbaqrui. ↑ 25.0 25.1 "Tactical Line-up – Round of 16 – Colombia v England" (PDF). Fédération Internationale de Football Association. 3 July 2018. https://resources.fifa.com/image/upload/eng-56-0703-col-eng-tacticalstartlist-pdf-2981372.pdf?cloudid=sz5v4igmsjufwpg723jk. ↑ "Colombia v England – Man of the Match". Fédération Internationale de Football Association. 3 July 2018. https://www.fifa.com/worldcup/matches/match/300331542/#motm. ↑ "Match report – Quarter-final – Uruguay v France" (PDF). Fédération Internationale de Football Association. 6 July 2018. https://resources.fifa.com/image/upload/eng-57-0706-uru-fra-fulltime-pdf-2982367.pdf?cloudid=zu6peytpxtyyzlqkmxcu. ↑ 28.0 28.1 "Tactical Line-up – Quarter-final – Uruguay v France" (PDF). Fédération Internationale de Football Association. 6 July 2018. https://resources.fifa.com/image/upload/eng-57-0706-uru-fra-tacticalstartlist-pdf-2982241.pdf?cloudid=rilnmmj4yferohrh740s. ↑ "Uruguay v France – Man of the Match". Fédération Internationale de Football Association. 6 July 2018. https://www.fifa.com/worldcup/matches/match/300331543/#motm. ↑ "Match report – Quarter-final – Brazil v Belgium" (PDF). Fédération Internationale de Football Association. 6 July 2018. https://resources.fifa.com/image/upload/eng-58-0706-bra-bel-fulltime-pdf-2982663.pdf?cloudid=lmitcdvz2nsoapxx5bxq. ↑ 31.0 31.1 31.2 "Tactical Line-up – Quarter-final – Brazil v Belgium" (PDF). Fédération Internationale de Football Association. 6 July 2018. https://resources.fifa.com/image/upload/eng-58-0706-bra-bel-tacticalstartlist-pdf-2982419.pdf?cloudid=ahulmjximpr087ewsjzr. ↑ "Brazil v Belgium – Man of the Match". Fédération Internationale de Football Association. 6 July 2018. https://www.fifa.com/worldcup/matches/match/300331538/#motm. ↑ "Match report – Quarter-final – Sweden v England" (PDF). Fédération Internationale de Football Association. 7 July 2018. https://resources.fifa.com/image/upload/eng-60-0707-swe-eng-fulltime-pdf-2983055.pdf?cloudid=o3awaoyalf7gwxwfu0z9. ↑ 34.0 34.1 34.2 "Tactical Line-up – Quarter-final – Sweden v England" (PDF). Fédération Internationale de Football Association. 7 July 2018. https://resources.fifa.com/image/upload/eng-60-0707-swe-eng-tacticalstartlist-pdf-2982958.pdf?cloudid=ayo0czkutbahniytrzwz. ↑ "Sweden v England – Man of the Match". Fédération Internationale de Football Association. 7 July 2018. https://www.fifa.com/worldcup/matches/match/300331541/#motm. ↑ "Match report – Quarter-final – Russia v Croatia" (PDF). Fédération Internationale de Football Association. 7 July 2018. https://resources.fifa.com/image/upload/eng-59-0707-rus-cro-fulltime-pdf-2983373.pdf?cloudid=uno0nrkctywxiuups07n. ↑ 37.0 37.1 "Tactical Line-up – Quarter-final – Russia v Croatia" (PDF). Fédération Internationale de Football Association. 7 July 2018. https://resources.fifa.com/image/upload/eng-59-0707-rus-cro-tacticalstartlist-pdf-2983104.pdf?cloudid=ze8dbw0ygeiigsuokz9g. ↑ "Russia v Croatia – Man of the Match". Fédération Internationale de Football Association. 7 July 2018. https://www.fifa.com/worldcup/matches/match/300331504/#motm. ↑ "Match report – Play-off for third place – Belgium v England" (PDF). Fédération Internationale de Football Association. 14 July 2018. https://resources.fifa.com/image/upload/eng-63-0714-bel-eng-fulltime-pdf-2985660.pdf?cloudid=thmhafcmqb56v9scd67t. ↑ 40.0 40.1 40.2 "Tactical Line-up – Play-off for third place – Belgium v England" (PDF). Fédération Internationale de Football Association. 14 July 2018. https://resources.fifa.com/image/upload/eng-63-0714-bel-eng-tacticalstartlist-pdf-2985539.pdf?cloudid=dldhpoqsvbdkebbwoicl. ↑ "Belgium v England – Man of the Match". Fédération Internationale de Football Association. 14 July 2018. https://www.fifa.com/worldcup/matches/match/300331536/#motm. ↑ "Match report – Final – France v Croatia" (PDF). FIFA. 15 July 2018. https://resources.fifa.com/image/upload/eng-64-0715-fra-cro-fulltime-pdf-2986102.pdf?cloudid=ahrvofztw0aucrsywr2c. 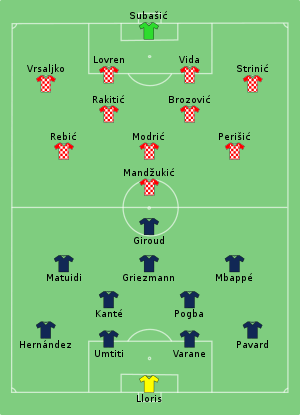 ↑ 43.0 43.1 43.2 "Tactical Line-up – Final – France v Croatia" (PDF). Fédération Internationale de Football Association. 15 July 2018. https://resources.fifa.com/image/upload/eng-64-0715-fra-cro-tacticalstartlist-pdf-2985964.pdf?cloudid=dgb3ez5bpdozyjnnfswg. ↑ "France v Croatia – Man of the Match". Fédération Internationale de Football Association. 15 July 2018. https://www.fifa.com/worldcup/matches/match/300331552/#motm. Hendan síðan var seinast broytt 11:27, 14. jan 2019.